By default, the KVM virtualization environment on CentOS 6 only creates a virtual network to which virtual machines may connect. The goal of this chapter is to cover the steps involved in creating a network bridge on CentOS 6 enabling guest systems to share one or more of the host system’s physical network connections. 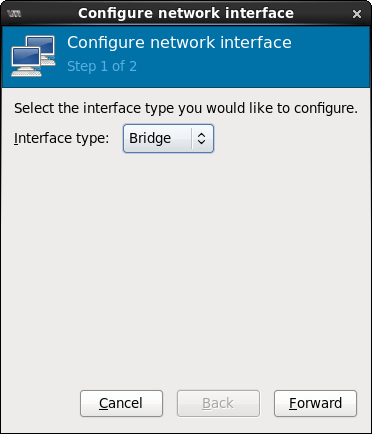 Network bridges may be configured on CentOS 6 either by manually editing the host system’s network configuration files, or by using the virt-manager tool. Both techniques will be covered in this chapter. 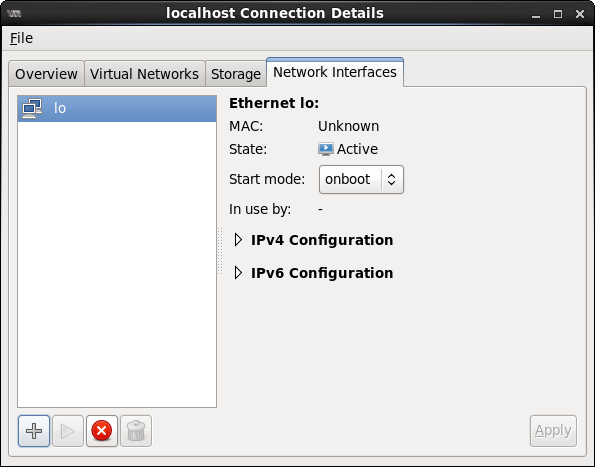 A KVM virtual machine running on CentOS 6 has two options in terms of networking connectivity. 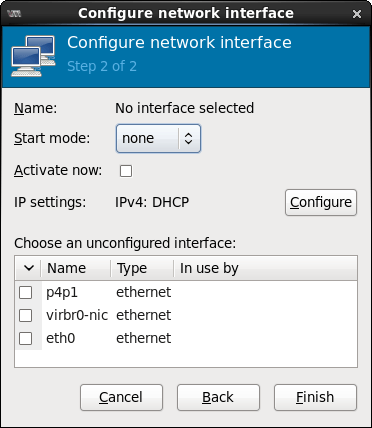 One option is for it to be connected to a virtual network running within the operating system of the host computer. In this configuration any virtual machines on the virtual network can see each other but access to the external network is provided by Network Address Translation (NAT). When using the virtual network and NAT, each virtual machine is represented on the external network (the network to which the host is connected) using the IP address of the host system. This is the default behavior for KVM virtualization and requires no additional configuration, other than selecting the Virtual network option on the Network screen of the virt-manager new virtual machine wizard. Typically, a single virtual network is created by default, represented by the name default and the device virbr0. In order for guests to appear as individual and independent systems on the external network (i.e. with their own IP addresses), they must be configured to share a physical network interface on the host. This is achieved by configuring a network bridge interface on the host system to which the guests can connect. In the remainder of this chapter we will cover the steps necessary to configure a CentOS 6 network bridge for use by KVM based guest operating systems. 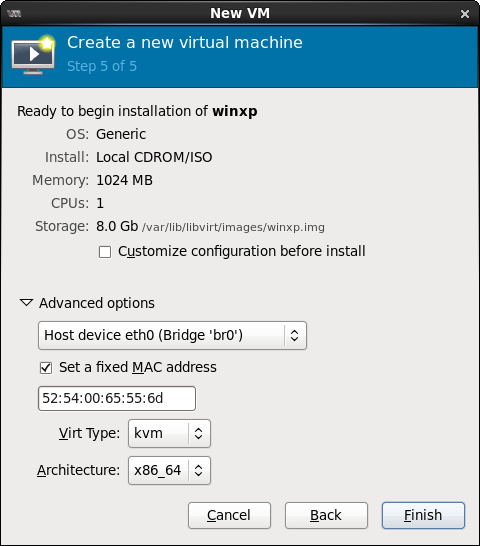 By far the easiest way to configure a network bridge on a CentOS 6 KVM host is to use the virt-manager tool. This tool may be launched either by selecting the Applications -> System Tools -> Virtual Machine Manager menu option, or by entering virt-manager in a terminal window. Within this screen, specify the name of the bridge (or use the default br0) and choose whether the bridge is to be activated now and on future system start ups. Finally, locate the physical device from the list to which the bridge is to be connected (in this case eth0) and set the corresponding checkbox. Once the settings are configured, click on the Finish button to commit the changes. On completion of the bridge configuration, the bridge will now be listed in the Network Interfaces screen with eth0 listed as the Slave Interface. In the above output, the entry for eth0 represents a physical network adaptor on the host computer. This is the connection currently used by this host to access the external network. The virbr0 entry represents the virtual network to which guest operating systems will connect if configured to do so. In order to provide the option for guest operating systems to share the eth0 connection of the host it is necessary to establish a network bridge between eth0 and the virtual machines. When this option is selected for a virtual machine it will have access to the external network using the same eth0 device used by the host. Assuming that KVM is now installed and a network bridge configured (if required), we are ready to move on to the next chapter and look at creating a CentOS 6 KVM Virtual Machine.